H&M Philippines Opens on October 17! OMGGGGG. I'm so exciteeed. I just can't hide iiiit. It's finally happening! H&M opens in Manila on October 17, 2014!!! The Swedish retail brand will open its doors at 9am until midnight at the Mega Fashion Hall in SM Megamall. The first store in Manila will be approximately 3,000 square meters and will encompass three floors offering the country’s fashion lovers the hottest trends as well as timeless basics at the best prices. The shoppingera in me is hyperventilating. Haha. The Philippines’ first H&M store will carry the brand’s full assortment for women, men, teenagers and children, including athletic wear and lingerie. The store’s crisp and bright interiors – reminiscent of expansive art museums and fashion galleries – will be the perfect backdrop to this selection, providing the best shopping experience for every fashion-conscious customer. The October opening will also coincide with the launch of the brand’s Autumn/Winter 2014 collection, at the forefront of which is the limited edition H&M Studio line. Had a sneak peek at the H&M showroom and I loved it!!! I'm sure you would too. Talked to Nikki about the prices and it's very reasonable!!! :) One sweater I was eyeing on was just P800 and a cute black skirt for just P599. This special collection is all about the modern-day bohemian woman, presenting playful prints, earthy colors and flowy silhouettes. For men, Autumn 2014 mixes Parisian cool with the attitude of London and the sleekness of New York to create a wardrobe for the mod urbanite. Customers shopping on the opening day will get to experience all of this first hand plus exclusive opening deals! The first 200 in line will get gift cards valued as high as P6,000 each, and opening offers that are up to 50% off. Regular store hours of 10am to 10pm will be resumed on October 20 onwards. Super winner!!! 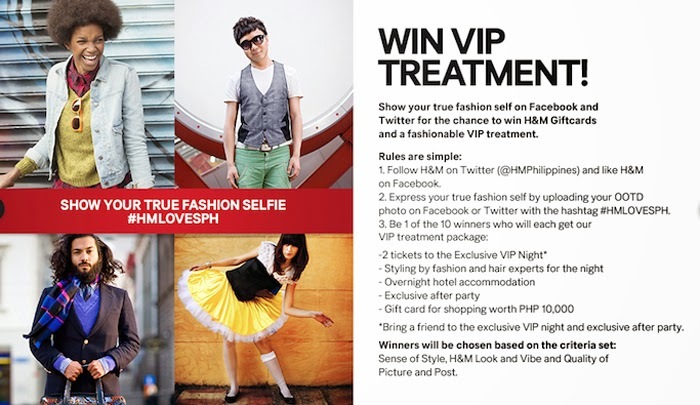 Follow @hmphilippines on Twitter for updates!